This bassist/composer/arranger has been a highly visible and integral contributor to the world’s jazz music scene for decades. 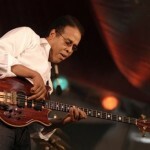 He’s performed with everybody, produced albums in several genres, owns his own record label, scores film and TV productions (appears on camera in some), designs and builds electric basses, plays jazz fests in Europe during the summer, and tonight Stanley Clarke brings his quartet to Brixton on the Redondo Beach pier. He’s gotta be 150 years old just to have compiled the discography on his resume. “I recently discovered a long lost photo with me, Chick Corea, Airto, Tony Williams and Stan Getz at the London House (Chicago) and we’re all in tuxedoes. It looks like one of those black-and-white shots from the 1930s,” Clarke said, laughing. Well, neither Clarke nor the picture are as old as mentioned. In fact, he’s a sprightly 58 years old who has no plans of slowing down. The two communicate quite beautifully on stage and in the studio, having recorded three all-time great jazz albums. Clarke now lives in Topanga. “Whenever you see houses floating down the street in devastating rains, I’m in there,” he said. He has lived on the West Coast for 14 years. Originally from Philadelphia, he started gigging in New York City in 1971 with greats including Horace Silver, Art Blakey, and others. I mentioned to Clarke that my first time hearing him was with tenor saxophonist Stan Getz. “That was a long time ago,” Clarke said. Ahhh, probably about 40 years. 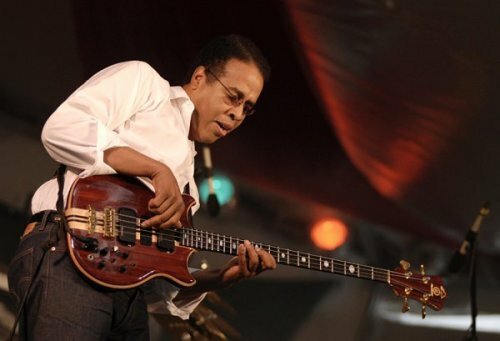 On the humanitarian side, in 2007, Clarke released the DVD of a 2002 concert entitled “Night School: An Evening with Stanley Clarke and Friends.” It was the 3rd annual Stanley Clarke Scholarship Concert, proceeds of which provide financial aid to students in need who excel in music. Last year, Clarke did a reunion tour of Return to Forever, the Chick Corea-led fusion jazz trail blazer that recorded 10 albums. There’s also a recent recording in Clarke’s vault of “Trio,” an acoustic ensemble featuring Bela Fleck and Jean Luc Ponte. “We did record the concerts; I just haven’t gotten around to listening to the tapes,” said Clarke.